If I could choose the weather for Saturday's race it would be just like today's: cold and dry. Unfortunately the extended forecast is indicating wet conditions for Saturday with rain storms likely. The good news is that the day's predicted low (usually the morning temperature) is below 50. So at least it should be cool. 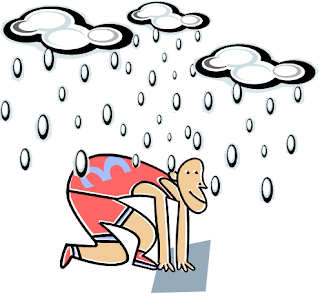 People have told me that they hate running in the rain. I actually think it's fun (within limits) and preferable to oppressive heat and humidity. The last time I ran in rainy conditions I made the mistake of wearing a light waterproof jacket that did a good job of keeping the rain off me but also trapped heat and moisture which made me very uncomfortable. No matter what, I will not be wearing rain gear during Saturday's run. This morning I concluded my training for the 5K with 21 minutes on the elliptical using moderate resistance. My intention was to keep a relatively fast pace without straining. While I did build up a sweat by the end, I considered today to be a light workout. My leg pain is still present but dissipating and I wanted to minimize impact but also work on flexibility. I think I accomplished my mission and by taking a rest day tomorrow I should be set for Saturday's 8:00 AM start. So what if it rains that day? It may give me a competitive advantage against my hydrophobic rivals.